Performing music from memory is a religious activity for me. It’s important, of course, for a performer to know the quality of the music being played; but it’s also important to know how the audience is likely receiving the music. There are number of things that affect that, including the performer’s appearance. I obviously have in mind live performances because listening is not the only important part of the art. If it were, it would be sufficient to listen to recordings in private. To help guide our perceptions I need to stress the importance of recognizing differences between practicing, playing, and performing. It is because I have seen so many students (and even teachers) who seem like they just play all the time, not knowing how to practice. When it is time to practice, we should not play but practice. I always compare this concept with sports. What if a baseball team only plays games all the time? They break into several methods of practicing during the spring training so that they will be ready for the upcoming season. Performing is similar to playing but takes different approach particularly in mind setting. I compare these to “regular-season” opposed to “pre-season” games. Pianists have performed music from memory since the time of Franz Liszt. It makes me more wonder why organists don’t exercise such an important practice. In this essay, I would like to discuss why we should perform the music from memory. The organist often has a disadvantage in communicating with an audience. Singers and most other solo instrumental players face the audience. In an organ concert, however, what we see is usually the back of the organist. Sometimes, we don’t even see the performer at all. In organ concerts, we can feel as though there is a wall between the organist and the audience. The music score in front of the organist makes this wall even thicker. It does not make him look as if he is truly playing for the audience. One of the ways to break this barrier, however, is to perform music from memory. Seeing the organist but having no score to distract them, the audience can feel a sense of communication with the organist. It is similar to a great speaker who delivers his speech without having notes. He exercises this practice because the appearance of himself reading the notes breaks the appearance of direct connection with his listeners. Have You Learned the Music? When an organist plays music with a score before him, we might well wonder if he has really learned the music well enough for the concert. Also, with the score in front of him, he looks like he is reading. His performance can easily start to seem as if he is just reading in public. If an organist plays from memory, he looks as if knows the music well; he seems to have a profoundly organic relationship with it. In the case of competitions or recording sessions, where note-perfect playing is essential, one might use a score. However, the concert performance is different; it’s a public event. There is no doubt that the music needs to be played well, but it is also important for the performers to demonstrate how well they know the music by playing from memory. In addition, we need to be reminded that the audience sacrifices their time (and in some cases their money) to come to the program, so most of them expect an exciting performance, one they can only experience in a live setting. The word “solo” means one. 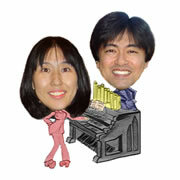 When an organist uses the printed music, one might need a page tuner, which makes “two” performers instead of “one.” Even though the organ console is highly equipped with many pistons and multiple memories, some organists demand two assistants: one to turn to page and another to push the pistons. This is the worst case scenario for organ concerts (unless one needs to play on a primitive instrument). This is a little out of the subject, but having someone to push pistons to change registration is like an orchestra conductor being unable to give cues to bring certain instruments in during the performance. Having to have an assistant nearby would make the conductor seem inept. Think of rock or jazz musicians. They almost never use music when they perform. They understand the importance of the visual aspect of communication in performance. As far as the musical notes are concerned, their music may be a lot simpler than organ music. However, those musicians spend a great deal of time and effort to prepare their concerts so that they can provide their best performance to the paid audience. They always look well-prepared, and the music sounds well-learned. No wonder they have huge crowds at their concerts. An organist visits a church that has a good pipe organ. He is asked to play the organ, but his reply is “No, thank you.” Why? The two most typical excuses for the organist to refuse such an offer in situations like this are: 1) “I don't have my organ shoes,” or 2) “I don’t have my music.” What a shame! If one had some repertoire memorized, he could have played something. More importantly, if the organist is capable of performing his repertoire anytime, even without music, he can create increase the possibilities of being asked to give concerts or to apply for jobs. Shall I Work or Cheat? One organist mentioned to me that he decides whether to memorize or not depending on how much his hosts pay him. When the fee is high enough, he says he works harder and plays from memory. He seemed to be making an honest confession. However, as a performing artist, he should work as hard as possible in any circumstance. I’m reminded of another organist who said he always plays from memory, that he’d feel he was cheating if had to have a score before him. The pipe organ is a complicated instrument. Some of the large organ consoles almost look like the cockpit of airplanes. So, playing such a machine with printed music in front of one is almost like driving a car while reading a map, which could easily cause a terrible accident. It also makes it more difficult to operate the complicated machine in full dimension if one has to read music while performing. One might argue that playing from memory is even dangerous. Yes, of course, it can be dangerous if one does not know the road he’s trying to drive on. However, if one studies and knows the road well, the journey should be safe and enjoyable. When the music is memorized, it is most likely learned thoroughly. Therefore, when one decides to play it again several years later, the music comes back a lot more easily because the process of relearning won’t take much time. This is especially true if one has performed the music from memory several times. We struggle to bring large numbers of people to organ concerts. Some non-musicians, however, do not like organ music and concerts because the sounds don’t appeal to them. I’m inclined to blame this on the long-time tradition of performers reading scores at the concerts and thereby putting an uncomfortable distance between themselves and their audiences. Most people sense what is around them with their eyes far better than their ears. The audience does not go to the concert to point out mistakes they might hear. Instead, they come to enjoy the experience of an exciting live performance; they expect the performer’s best effort. In fairness, it may appear to us that some people have more talent in the art of performing from memory than others. Performing from memory takes special skills, but those skills can be trained. I am not going to discuss how to memorize, but I would like to point out two important keys for memorization: an optimistic attitude and habit. I find it is a lot easier to memorize music I like. If one can memorize one measure of music, one should be able to do the same for a 100 measures of music. Finally, performing from memory needs to become a habit for an organist. If one does it all the time, it starts seeming like the natural thing to do.